Through composting, students learn to pay attention to their waste, bringing consciousness and ecological thinking into the lunchroom. Compost Crusader provides composting service to many area schools already with great results. Some schools have been able to divert around 50% of their overall waste stream by properly source separating their cafeteria "waste". 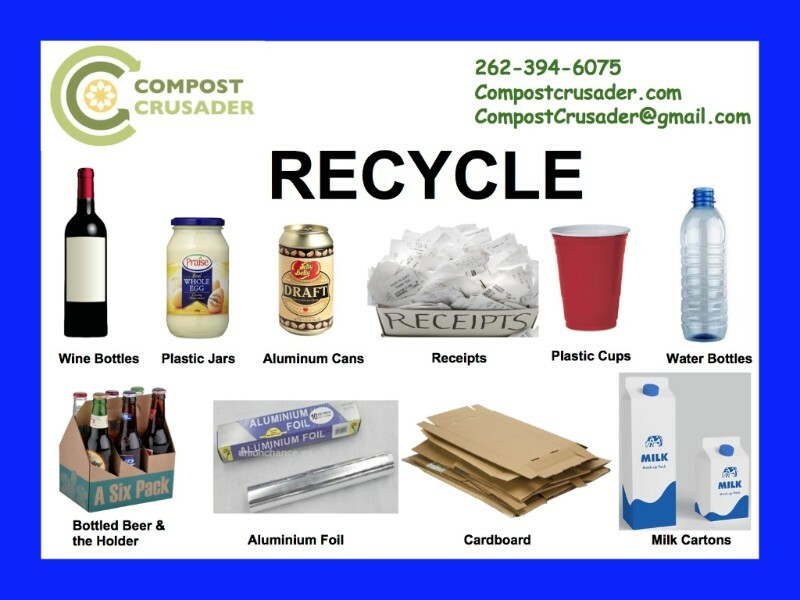 As students become conscious of their waste stream, regular recycling increases tremendously through the cafeteria compost program. 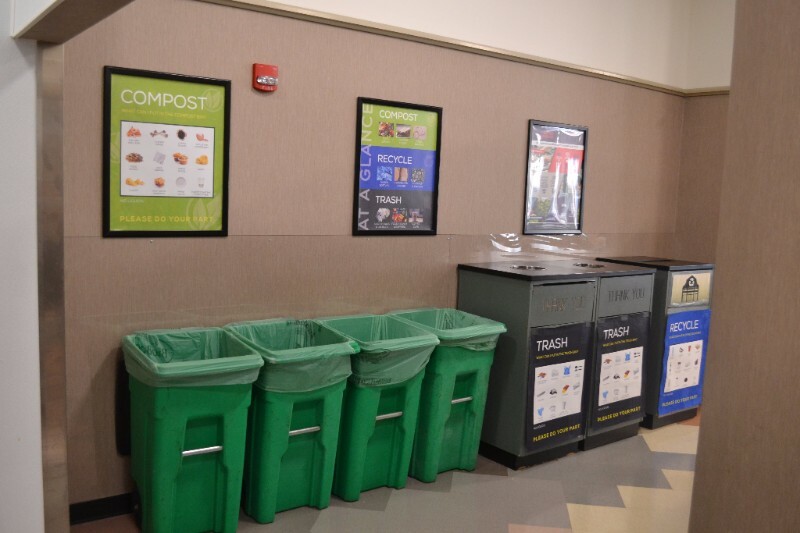 Marquette University is a great example of how to implement and sustain a compost program. According to Brent Ribble, sustainability coordinator at Marquette. "(Marquette is) starting to become more intentional to a dedicated and strategic approach to sustainability." Last year was a great success for Marquette. The composting program rolled out at seven locations on campus in the fall. The composting effort remained strong, with no decline in usage later in the year after the novelty and excitement wore off. Approximately one ton of material was diverted from landfills per week across 7 locations. Much of the credit goes to staff at Sodexo, the company that runs the kitchens at Marquette. Scott Miller, Manager at the Marquette Place cafeteria,says that pre-consumer composting is simple. Placing compostable material into compost bins is simply part of the job to the kitchen staff. 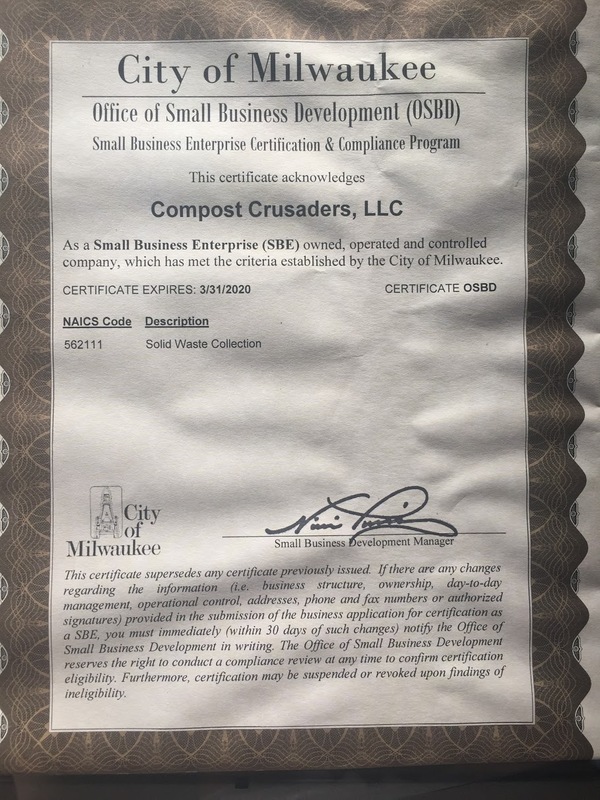 When non compostables end up in the outside bins, Compost Crusader creates a contamination report and emails it directly to the on site contact. This way, the mistake can be corrected at the source of the problem and visuals can be shared to other cafeteria locations as a lesson learned. 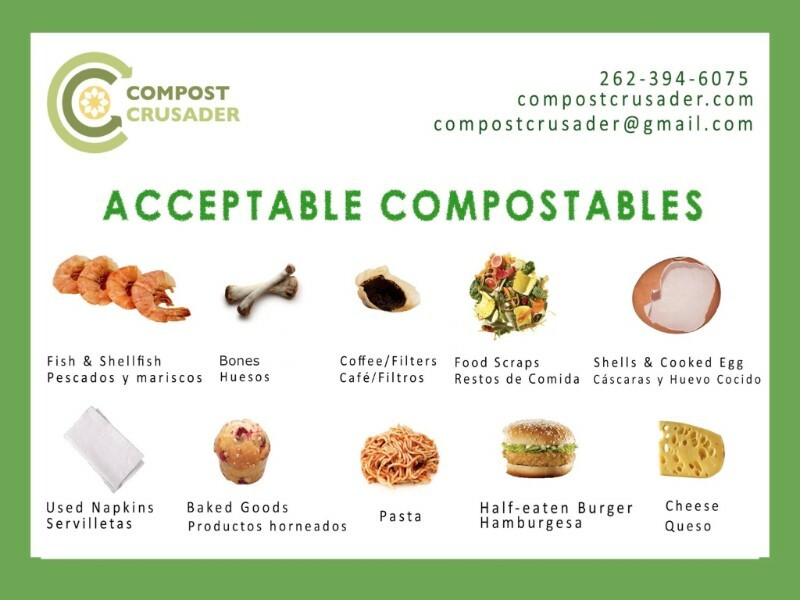 The challenge in this undertaking is that in a cafeteria setting, the responsibility to sort what is compostable is shared among the hundreds of people who have access to the compost receptacle. Signage is one component of the education and helps reduce contamination. Big colorful signs next to the compost bins are something that Marquette has consistently improved on. 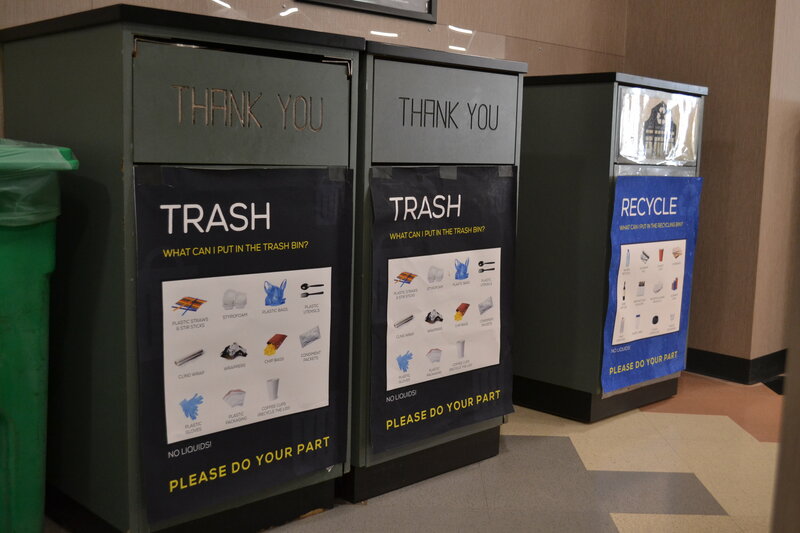 Volunteer groups have been responsible for signage in the last last year, but now the University has improved signage over the bins in a big way. Using actual pictures of products served in your cafeteria will help with any language barriers and takes some of the guess work out of of sorting. Another aspect of the education of students and reduction of contamination are actual staff and volunteer ambassadors. "Myself and others from our student environmental organization volunteered at our larger cafeteria whenever we were available during peak times, and the cafeteria itself sent out employees to monitor the compost bins." Said Hannah Badeau, president of Students for an Environmentally Active Campus. This strategy is vital to reach the students who are not paying attention, or are not interested in composting. Although it may seem like a burden to staff compost bins during peak hours, its a vital component of the composting effort. 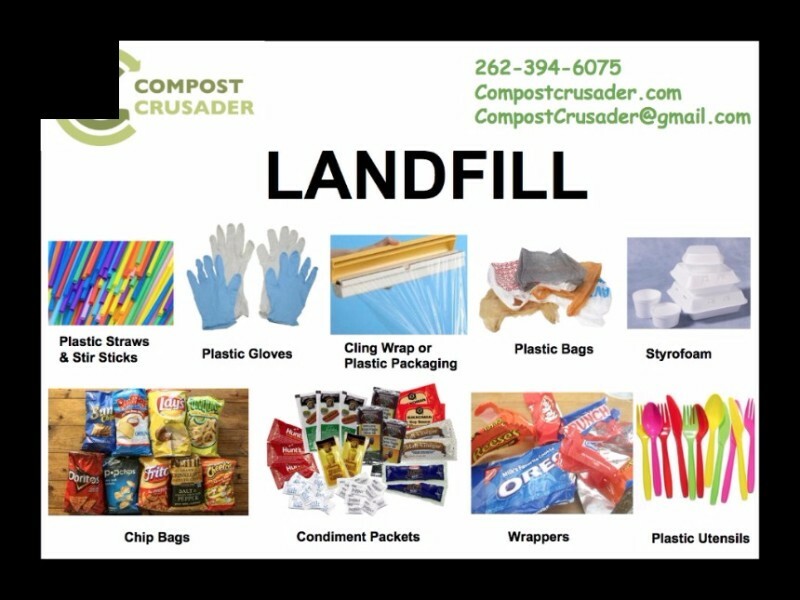 No matter how large your school is or what grade the students are, if you are a parent, student, or teacher and you think your school is ready to start composting, let your admins and school board know. 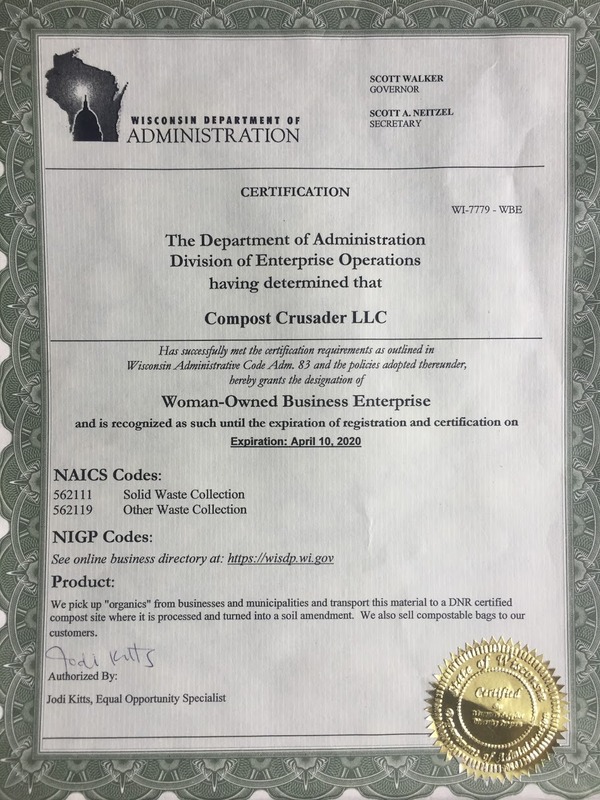 They can contact Compost Crusader to learn more about what we can offer in the form of regular compost pickup, compost receptacles, as well as help setting up an effective program for cafeteria composting in your school! Here are some resources that you can share with faculty and students whether you have a compost program already or were thinking of one. Composting in schools is not something that should be expected to become the norm overnight. Marquette is on a journey that started with a few students and administrators several years ago, and has grown steadily. Yours can too! Copyright © 2017 Compost Crusader LLC, All rights reserved.